If you can think it. We can print it. 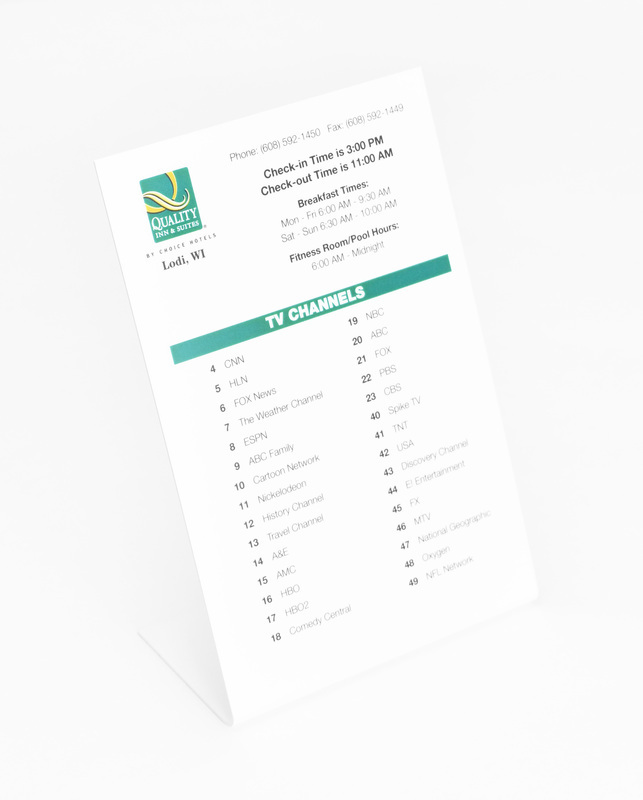 Choose from our wide range of hotel telephone faceplates and commercial printing services. 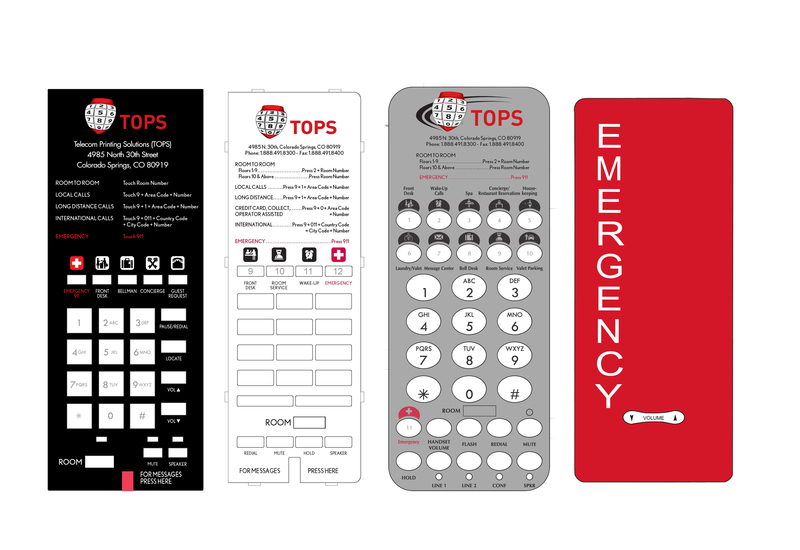 TOPS offers a wide range of printed products, including hotel telephone faceplates (paper and plastic), paper tent cards, plastic “L” and “A” shaped stands, plastic and aluminum labels, door hangers, TV channel selectors, telephone rate cards, rack cards, amenity cards, comment cards, name tags, and do not disturb signs. If you can think it, TOPS can print it! 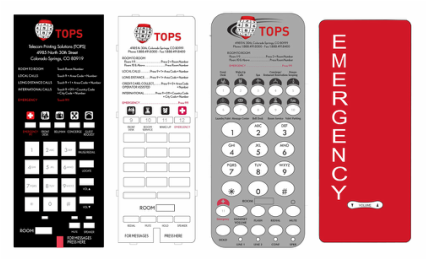 Choose TOPS custom crystal plastic faceplates to complement the look of contemporary flat screen televisions and appliances in the room. Clear plastic faceplate overlays help protect your faceplate investment and facilitate cleaning and maintenance with housekeeping staff. From and inexpensive paper tent card to a high end very durable plastic “L” or “A” stand, TOPS can get your message out to your guests. Stands for your front desk, lobby and guest rooms. Make sure your guests don’t miss a thing. 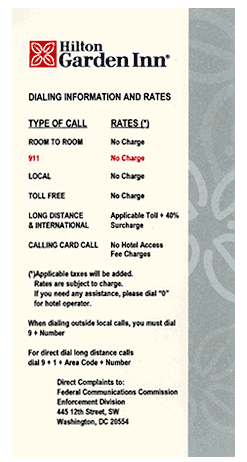 Keep your guest informed and your hotel compliant with either plastic or paper hotel telephone rate cards. Functional, compliant and looking good. Ask us for samples. Don’t leave that money on the table!! 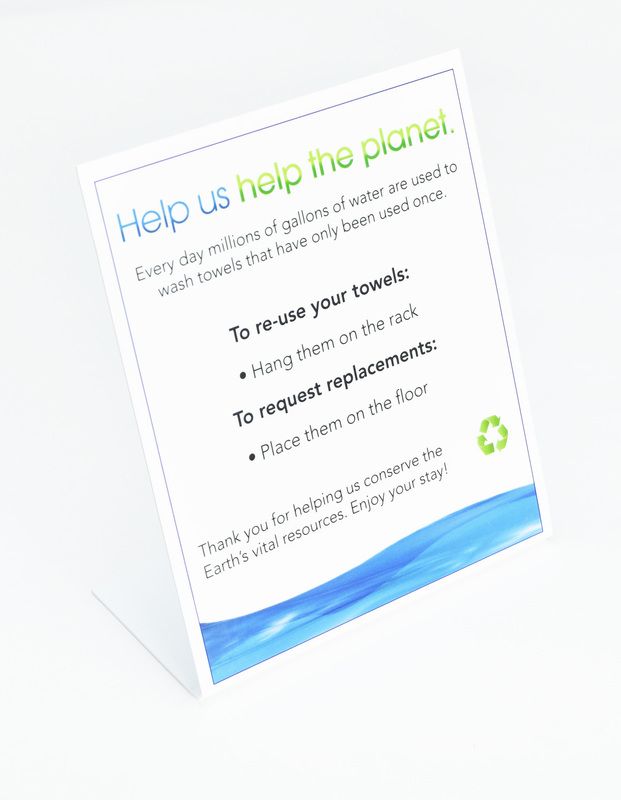 Whether it is $2 a bottle or $5 a bottle, let your guest know with TOPS water bottle danglers. Need to get your message across, adhesive backed labels are just the ticket. For those light traffic areas, use our plastic adhesive backed labels. For those high traffic areas, step up to our aluminum adhesive backed labels. Rough, tough and good to go. Adhesive-backed, coated labels are available in many sizes including full color printing on paper or plastic stocks with coatings that repel dirt and wiping away spots with standard cleaning fluids. Are your hotel evacuation signs up to date and in good shape?? If not, give TOPS a call and let us put it together for you. TOUGH STUFF!! Our aluminum labels go on easy, but are hard to peel off. Choose our high-quality .020 aluminum labels with baked on finish, and top rated 468 3M adhesive, one the strongest available. 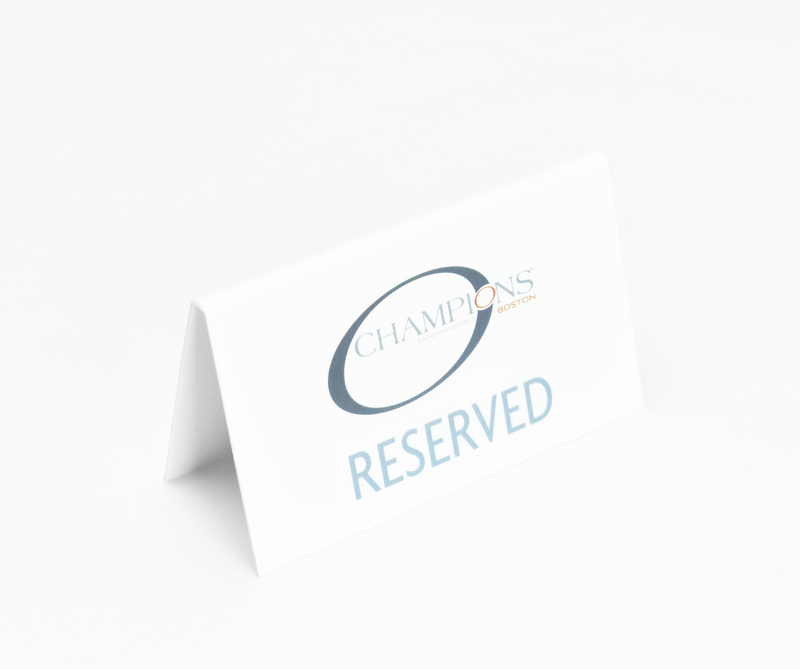 Whether you need us to help you design and print new business cards, or simply provide reprints of your existing cards, ask us for a quotation for your next project. 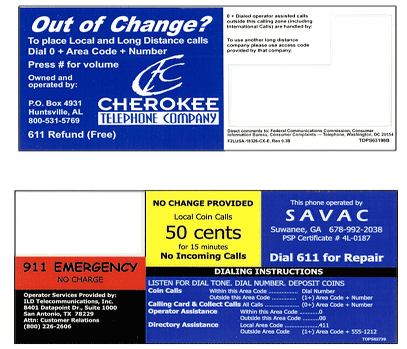 Make sure that your payphones are compliant in your state with our heavy duty plastic upper and lower signage cards. Let us help you look good and draw in those quarters. Don’t forget about the aluminum adhesive backed labels. The perfect product to advertise what your payphone can do. 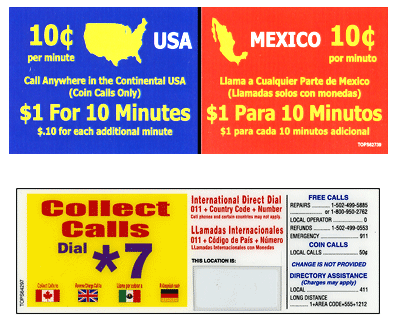 “Dial Mexico, 3 minutes for $1.00?” No problem, we got that. 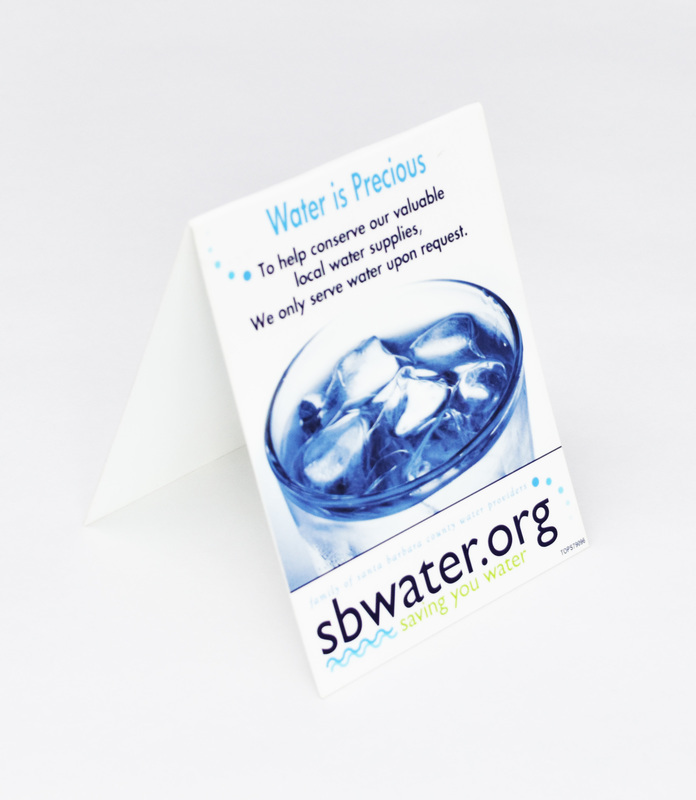 We produce upper and lower signage from durable 30 mil plastic. The size of these signs is based on the phone manufacturer. The traditional use of the lower card is to provide the necessary governmental regulatory and legislative information. Upper and Lower Signage custom designed per your request! Make sure that your customers know just how to work your ATM machines with our aluminum or plastic adhesive backed labels. We can help you with all of your signage needs. Changing the price on your water/air machine?? Go with our highly durable aluminum labels. The touch stuff!! Adhesive backed labels also available in adhesive backed plastic. Get your message out there! 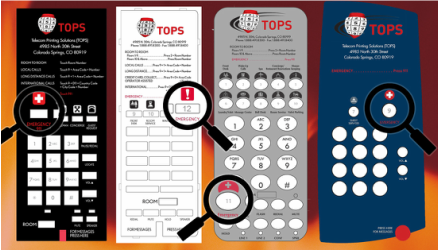 TOPS offer a full suite of full color, spot color, and black and white commercial printing services. Let us bid on your next brochure, flyer, postcard, or letterhead, envelope, and business card requirements. Don’t see what you need on our web site? Please give us a call; most likely, we can help you. We have the ability to print on paper and plastic and can die cut or heat bend your project into many shapes. 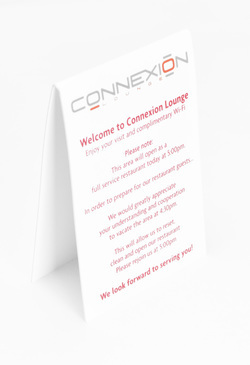 Whatever your printing needs, we appreciate the opportunity to serve you. Following are a few examples of our work for your review, however, we are fully prepared to help you create your own custom printed materials designed to meet your specific design requirements, or existing or emerging hotel brand standards.